Bombay (we reserve our right to call it that for historic purposes) has had more facelifts than most starlets in the entertainment industry. It’s a city that has transformed beyond recognition for those who have had the good fortune to look out at the same view for over a decade; and into a completely different world for anybody who’s been around for longer than that. It’s made the shift from an archipelago of seven islands to the metropolis it is now, but for our story today we’re taking a trip back to its former heydays. As far back as the 16th century, each one of the seven islands were protected by forts that had been built by ancient kings, the Portuguese and the British. And even though these were built using primitive methods and rudimentary material, they are considered to be magnificent works of architecture and testaments to military strategy, even today. To our generation, these forts have varying levels of significance. For some, it’s the go-to haunt for couples to get cosy away from prying eyes, to others, nothing more than a slightly dilapidated landmark that their taxi driver will surely know to get them to their actual destination and to our most filmy counterparts, a scenic location to shoot a Bollywood song perhaps. Of course, we’re here to cast aside the ordinary labels for a bit and dwell upon the stories that make them fascinating even today. Homegrown’s history lessons are officially in session. Significance: Administrative building & the residence of the First Governor of Bombay. Also known as Casa da Orta , the Bombay Castle is one of the oldest surviving structures from the history of Mumbai. From 1554 until his death in 1570, a Portuguese nobleman Garcia de Orta had leased the Bombaim Island from the King of Portugal and he built the Manor House here. When the East India Company came to India, it took control of the castle and began to construct fortifications around the mansion. What makes this one of the most important parts of the city’s heritage is that fact the Fort and the city of Bombay both grew from and around it. When the Company shifted its headquarters to Bombay, the Governor resided in the Bombay Castle. Gerald Aungier, the first Governor of Bombay used to stay here. In 1934, the formation of Royal Indian Navy created a need for space and they were able to acquire Bombay Castle and so today, we can find two gates of the Manor within INS Angre, in South Mumbai. There are various other pieces of history that you can find here, such as large portions of the original Castle walls and bastions, here. At present, the building acts as the office of the Flag Officer Commander-in-Chief of the Western Naval Command. Did you know? A sundial that is believed to date back to the Portuguese era can also be found here. What makes the sundial different is that it does not mark the 12 hours of the day but certain periods the people then thought to be important. Significance: A watchtower located around a freshwater spring. 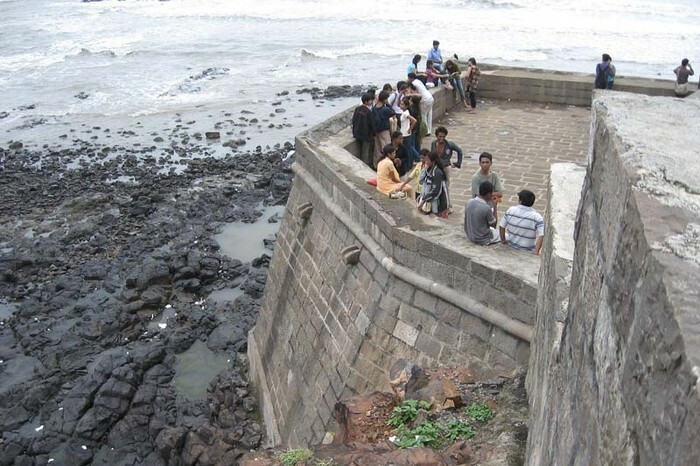 Popularly known as the Bandra Fort, Castella de Aguada was built by the Portuguese in 1640 as a watchtower overlooking Mahim Bay to the south, the Arabian Sea to the West and southern islands of Mahim. Also meant to the guard the northern sea route into Mumbai Harbour during the Portuguese rule, the fortifications used to be armed with seven cannons  and smaller guns. Translated, Castella de Aguada means ‘Fort of the Waterpoint,’ which is apt considering that there is a freshwater spring  in the vicinity that supplied potable water to the ships cruising the coasts. At the beginning of the 18th century, following the defeat of the Portuguese, the Marathas were emerging as strong political powers and all British properties in India were under threat. So the British did the one thing they could to ensure that they wouldn’t lose control over their properties and demolished a part of the ‘killa’ so that the Marathas wouldn’t be able to capture and use it to their advantage against the British army. Despite the precautions that had been taken, the Marathas captured the island in 1739  and reigned over it until they lost it to the British in the First Anglo-Maratha War in 1774. Afterwards, in 1830, the British donated various portions of Salsette Island including Land’s End (where Castella de Aguada is located) to a Parsi philanthropist, Byramjee Jeejeebhoy. He established his residence here and ultimately, the region was renamed to Byramjee Jeejeebhoy Point. Did you know? It is believed that “Castella” is really a misspelling for Portuguese word “Castelo” meaning castle This means the intention might have been to name it Castelo de Aguada. If you were to head down to the Worli Fort, the unmistakable smell of fish is likely to take over your senses thanks to its location in the middle of the Worli fishing village. But there is more to this place than just the tiny bylanes filled with fisherfolk that lead us to it. A magnificent structure that stands on the Arabian Sea that was built by the British around 1675 as a precaution against invasions, you might find it hard to believe now but the importance of this structure lies in its strategic location. If not for this fortress, Bombay would have remained open to outsiders for attack. It was strategically located in such a way that it overlooked the Mahim Bay at the time, and from here, the British could keep a lookout for enemy ships. It is quite unfortunate that our Government has made no efforts to protect this heritage site and it is because of the British architectural brilliance that the ancient watchtower has managed to retain its old glory. Did you know? Many wrongly assume that the fort was constructed by the Portuguese around the 16th century but in reality, it was built much after the Portuguese left the country. Significance: Defensive structure during the British times. Located in the Dongri area, known locally, as the Irmitri Fort. In the 17th century, the East India Company evacuated the Koli tribes from the island and built the fortifications. Ever since the 1739 Maratha invasion, it has been in ruins and over the years, the conditions have only worsened. So much so that it has been classified as “endangered” by the Archaeological Survey of India. For a while now, the locals around the area have taken up the responsibility of its maintenance. If you are in Mumbai you must go and enjoy the breathtaking view you will get from up there. Since it was built as a watchtower, it allows you to take a 360 degree view of its surroundings, with the Arabian Sea at the West, the Vasai fort at the North, the Borivali National Park at the East, and the EsselWorld and Water Kingdom at the South. Did you know? Every October, the feast of ‘Our Lady of Fatima’ is celebrated there and it is quite an event with people from far off villages coming to offer their prayers. For many Mumbai residents, Vasai is not a place which one thinks about or brings up in conversation, something which is bound to change when one learns of the interesting history behind the region. Referenced in 2nd Century inscriptions of the Kanheri Caves, Vasai is said to have been an important trading centre in the medieval ages. Malik Tughan, the commander of Bahadur Shah, the Sultan Of Gujarat, built a small fort like structure in 1533 AD and the following year, Vasai was ceded by the Portuguese. The Posturgese then went on to develop the same site in what came to be known as the vast and expansive Bassein Fort by 1590. The next 150 years saw the region enjoying prosperity and opulence with Bassein becoming the second most important location for the Portuguese after Goa. The Portugese built magnificent houses, convents and churches in the region where only the Portuguese nobles were around to live within the fort walls. The Portuguese rule came to an end in 1739 AD when the Chimaji Appa, Peshaw Bhajirao’s brother stormed with fort with great loss of life and the fort was ultimately ceded to the British in 1817. The remains of various structures such as the citadel are there for anyone to peruse even today when they visit Bassein. Did you know? This is where Peshwa Bajirao II signed the infamous Treaty Of Bassein which bought an end to the Maratha Confederacy. Bassein is also well know for the flora and fauna which has grown amongst the ruins. The East India Company and the Mughals were constantly at war with each other because of their interest in India. The Siddis, an ethnic group of African descent had allied themselves with the Mughals and were constantly attacking the British. Unable to deal with the relentless attacks, the British constructed several fortifications around Mumbai, including the Sewri Fort. The British went all out to create a fortress that would protect them and so it was protected by an army of 50 sepoys under a subedar. 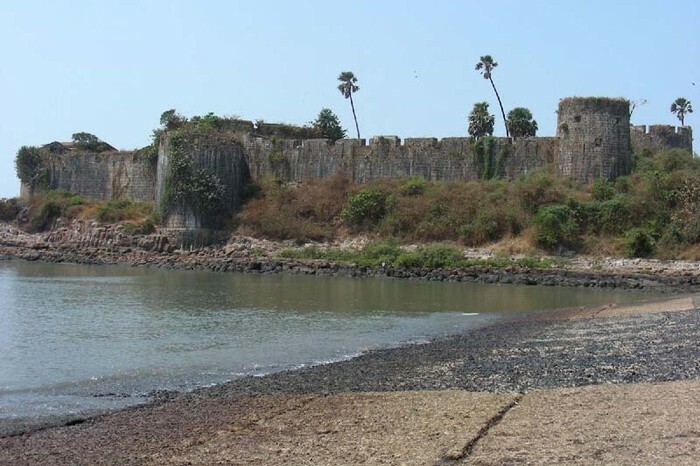 In 1689, the Siddi general, Yadi Sakat, with an army of 20,000 men, invaded Mumbai and captured the Sewri fort, the Mazagon Fort, and went on to sack the town of Mahim. Once the regional powers fell, the building came to be used to house prisoners and subsequently became a Bombay Port Trust store. 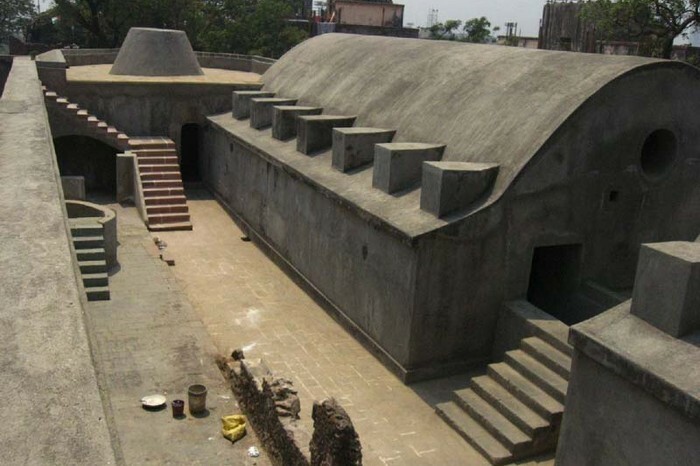 At present, the fort is owned by Maharashtra State’s Department of Archaeology and Museums. Did you know? It is rumoured that the army stationed here were equipped with around 8-10 cannons and it is because of these cannons that they were able to repel a Portuguese attack in 1772. Significance: Used as a defensive fortification. Back in 1769, the British began to fear the rapid success of Napoleon Bonaparte and decided to get prepared for any unexpected attack from him. So they built the St. George Fort or Fort George , as an extension of the fortified Bombay region. Along with being a defensive fortification, it was also used as a warehouse for arms and ammunitions. The logic behind its construction was that if Napoleon were to attack, then the army on the main fort and navy would engage in war with French army and if they were to feel as if they are failing then they would take the shelter of the Marathas, traveling through Thane or Panvel by boats. The British successfully defeated the French and once again consolidated their position in India. Once its purpose was served and the British no longer needed the fortress, Sir Barter Fier demolished it. In the period of 1889 to 1892, a hospital called St. George was build in its place and its remains can still be seen. Significance: Used as a watchtower by the British. The Sion Hillock Fort was built atop a conical knoll for defense purposes, under the regime of the English East India Company, between 1669 and 1677 so it could keep a watch out for an attack from three sides-- the Siddis from South Mumbai, Portuguese from the North and Marathas from the East. After 34 years, the Marathas and Peshwa dynasty declined and Salsette came under the British control while citadel was completely ignored, which is reflected in its current condition. The entire structure is broken down and in ruins. After Independence, it became the responsibility of the Archaeology Survey of India Authority but very little has been done. In 2009, efforts for its restoration began but was stopped midway due to lack of funds. Did you know? At the base of the hill is a garden--the Pandit Jawaharlal Nehru Udyan-- through which you reach the fort. This garden used to be a firing range, once upon a time. Significance: Used as watchtower to guard against the Portuguese and Marathas. Hidden between the slums of Dharavi, we will find the Riwa Fort that was built by the Portuguese at the beginning of the 17th century, which remained in their control until 1665 when the British gained control over it. Because it was made using black stone, the locals commonly refer to Riwa Fort as the Kala Killa (Black Fort). In 1739, the island of Salsette was ceded to the Marathas and their power became obvious to everyone, including the British. They realized the importance of the Riwa Fort in helping them beat the Marathas and began to use it as a watchtower. For many years, the fortress was fully functioning but with the change of war techniques, it began to lose importance. Sadly enough,the structure is currently in a broken down state and is still holding on thanks to the efforts of some locals around the area. Did you know? There are three citadels in a stretch--on the Eastern Express Highway, on the Sion railway lines and the third behind the bus depot at Dharavi--making the exact location of this fortress a mystery even today. Popularly known as the Versova Fort, the Madh Fort was built by the Portuguese as a watchtower in order to get a strategic view of the coastline when they began acquiring Salsette and Versova. The 17th century was an era of political imbalances in India with everyone trying to gain power. The Company at this time, had a strong foothold in India and when they understood the strategic importance of the blockhouse, they began to put pressure on the Portuguese King to hand it over. After the 1739 war between Marathas and Portuguese though, a treaty was signed and Versova came under the Marathas. Once it became obsolete, it became the training centre for cadets. Till 1818 there was an army base and after Independence it came into the authority of Indian Air Force. Even though it looks intact externally, the structure is actually dilapidated. Did you know? The fort has featured in many Bollywood movies like Manmohan Desai’s “Mard” (1985) and Eeshwar Nivas’ “Love Ke Liye Kuch Bhi Karega” (2001). Several episodes from the Hindi TV series ”C.I.D” have also been shot here. In 1138, Pratabh Bimb brother of King Gowardhan Bimb of Champaner, started campaigning towards Northern-Konkan, which brought him to Mahim, Thana, Madh and Vesaway (Versova). It was during his rule that the Mahim Fort was constructed. In 1516, Portuguese commander Dom Joao de Monoy entered the Mahim Creek and defeated the commander of the fortifications and it remained under Portuguese control until 1661 when the Portuguese ceded the island of Mahim as dowry to Charles II of England. After the English gained control of the fort, it became a strategic watchtower against possible Portuguese attacks, and later from the Marathas. In 1684, Sir Thomas Grantham strengthened the fort further because of which they were able to successfully repel the Portuguese attack in 1772. Mount Mary’s Basilica was also damaged during this encounter. Soon, its importance began to dwindle till the citadel came to be ignored completely. Till the beginning of 20th Century it was under the Custom Office, and later on, up to 1960 became the residence of the Custom and Collector’s Officer. Due to lack of attention, the mushrooming of slums and encroachment around the fort, its condition has only worsened. Did you know? 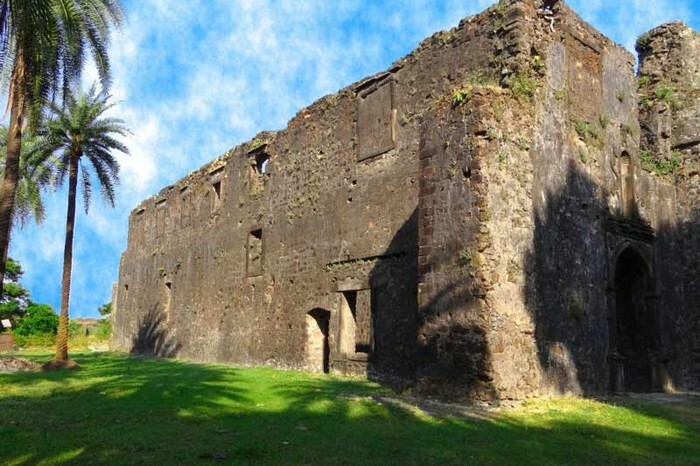 Many believe that the Mahim Fort was built by the first governor of Bombay, Gerald Aungier but in reality it had been existing for years before the British came to India. Significance: Used as a watchtower. 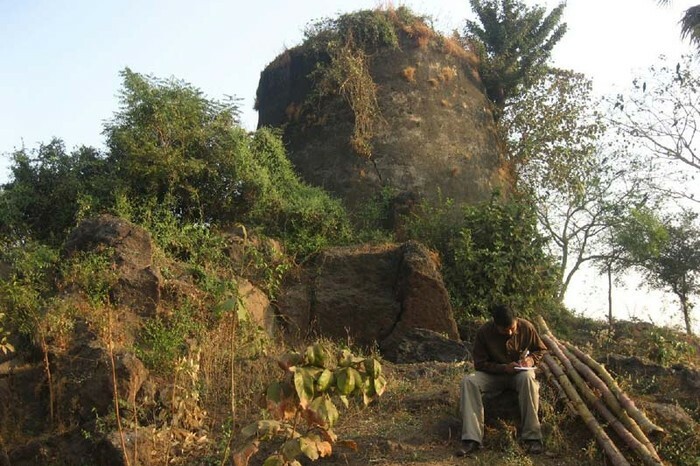 There is very little known about the history of the Mazagaon fort except that it is one of the many watchtowers that had been built by the British to protect themselves from the attacks of the Siddis and the Marathas. In 1689, the Siddi general, Yakut Khan, with an army of 20,000 men, invaded Mumbai and captured the Mazagaon fort. The British governor Sir John Child appealed to the Mughal Aurangzeb to reign in Yakut for a price and the Mughal emperor agreed, on the conditions that rupees 1.5 lakhs be paid, and Child be sacked. Did you know? The John Baptista Gardens in Mazagaon now stands exactly where this fortress once stood.